Mountain View, CA – A new survey of small business owners finds that a majority incorrectly believe health care reform requires them to provide health insurance for employees in 2014, or that they’ll be taxed if they don’t offer health insurance next year. The survey of small business owners with fewer than 50 employees was conducted by eHealth, Inc. (NASDAQ: EHTH), the parent company of eHealthInsurance.com, America's first and largest private health insurance exchange. Survey responses were gathered online between February 12 and February 15, 2013 from 259 small businesses that had purchased health insurance through eHealthInsurance.com. The survey reveals that only eighteen percent (18%) of small employers believe they can confidently define or explain what a health insurance exchange is. Nearly two-thirds (62%) admit to not understanding exchanges at all, while twenty percent (20%) say they have only a vague understanding of the role exchanges are expected to play. Government-run exchanges, which are slated to come online in October of 2013, would make subsidized health insurance available for lower income people who don’t get health insurance from their employer, starting in 2014. The ACA also calls for the creation of Business Health Options Program or “SHOP” Exchanges for small businesses.eHealth conducted a similar survey in August of 2012, when the looming Presidential election cast some doubt on the future of the Affordable Care Act (ACA). At that time, survey results showed that sixty-nine percent (69%) of small employers misunderstood the employer mandate. This new survey shows that the number of small employers who misunderstand the employer mandate has shrunk to a slim majority of fifty-six percent (56%). Beginning next January, the ACA does require businesses with the equivalent of 50 or more full-time employees to offer their employees health insurance or pay additional taxes. The ACA does not require this of businesses with fewer than 50 workers. Buying Insurance through Exchanges: The survey also reveals that the overwhelming majority of small business owners do not want to be forced to buy health insurance through any single source, whether through a government exchange or through a private marketplace/exchange like eHealthInsurance.com. Seventy-one percent (71%) say they want the option to buy their health insurance coverage from the source of their choice. Only twenty-four percent (24%) said they would prefer to work exclusively with a private company to find health insurance, and five percent (5%) say they would prefer to work exclusively with a government exchange. Even with these new rules in place in 2014, two-thirds (67%) of small business owners say they would not stop offering their employees health insurance. According to the survey, only six percent (6%) say they’ll definitely stop offering health insurance to employees, while another twenty-seven percent (27%) say they may stop offering health insurance under certain circumstances. Ninety-one percent (91%) of the small employers who are considering dropping insurance for employees say that the cost of providing health insurance impacts their decision. The survey shows that employers offer health insurance to employees, first and foremost, because they feel morally obligated to do so. Forty-four percent (44%) cite this moral obligation as the number one reason they offer health insurance to employees. However, in 2014 that sense of obligation could go away for some employers as access to individual insurance becomes guaranteed, regardless of an applicant’s medical history. In the past, access to employer-based insurance was guaranteed but applicants for individual coverage could be declined due to their medical histories, in most states. Would dropping insurance mean losing employees? : For nearly a third of small employers (31%), the number one reason they offer health insurance to attract talented workers. Seventy percent (70%) of small employers believe it’s at least possible their employees would look for work elsewhere if they stopped providing health insurance. Most employers believe they’ll need help understanding and securing health insurance next year when the new rules kick in. Seventy percent (70%) expect their choices to be complex enough to require outside assistance. Employers admit to being confused by the Affordable Care Act (ACA) and say they’re most likely to turn to their agent or broker when they have questions. When small employers were asked to list the information sources they trust the most, seventy-two percent (72%) say they trust their health insurance agent or broker, thirty percent (30%) say they would turn to a small business association or group, twenty-eight percent (28%) would work directly with their insurance company and twenty-four percent (24%) would choose to reach out to a government agency for help. Finding help amidst the changes: All of the employers in this survey work with eHealthInsurance.com, a licensed health insurance marketplace. When asked to list their motivations for working with a licensed agent or broker, they say they wanted to know all of their options (82%), find the best prices (81%) and find the highest quality insurance for employees (68%). Hiring new employees and the Affordable Care Act: Among those employers who correctly interpret the employer mandate, eighteen percent (18%) say that the Affordable Care Act will have an impact on their hiring plans for 2014. 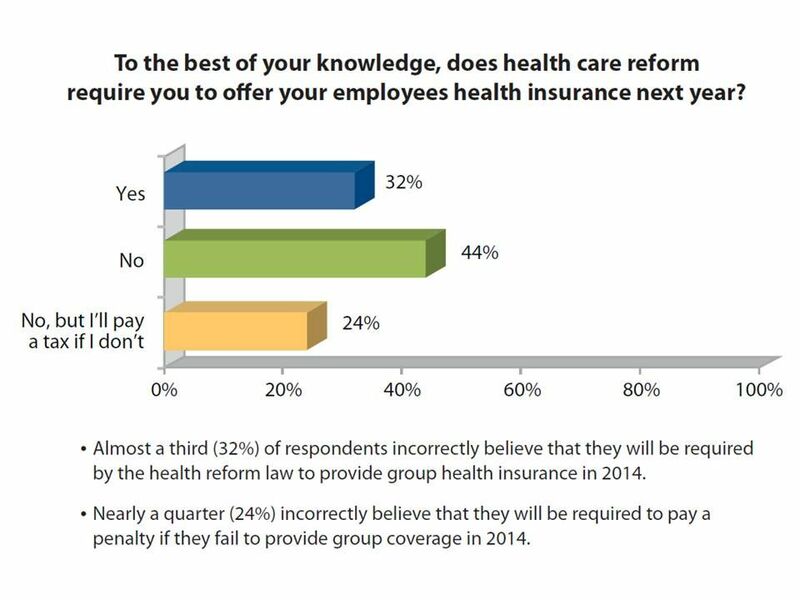 Among all employers surveyed, a third (33%) say the ACA will have an impact on their plans to hire and grow their business in 2014 and beyond. Expectations of health insurance costs in 2014: When asked to predict what they think will happen to health insurance costs in 2014, fifty-nine-percent (59%) of small employers say they expect costs to go up. Only eleven percent (11%) say they think costs would go down and twenty-one percent (21%) admit they don’t know what will happen to costs. Only eight percent (8%) do not expect the ACA to impact costs at all. The online survey of small employers was conducted between February 12 and February 15, 2013, and gathered a total of 259 responses. Of these, 95 percent had between 2 and 10 employees. eHealth’s Small Business Survey report can be downloaded in full here (http://news.ehealthinsurance.com/_gallery/get_file/?file_id=514a002dfc96aa2799001afe&file_ext=.pdf) or through the Research section of eHealth’s Media Center located at news.eHealthInsurance.com. eHealth, Inc. (NASDAQ: EHTH) is the parent company of eHealthInsurance, America's first and largest private health insurance exchange where individuals, families and small businesses can compare health insurance products from leading insurers side by side and purchase and enroll in coverage online. eHealthInsurance offers thousands of individual, family and small business health plans underwritten by more than 180 of the nation's leading health insurance companies. eHealthInsurance is licensed to sell health insurance in all 50 states and the District of Columbia. For more health insurance news and information, visit the eHealthInsurance consumer blog: Get Smart – Get Covered. Small Employer: How does the employer mandate work? In a survey of 259 small employers with fewer than 50 employees, less than half (44%) understood how the employer mandate in the Affordable Care Act would impact their business.